1. Today is Go Texan Day. Did you know that? Do you even care? Yeah, I feel the same way. I mean, I big, puffy heart L-O-V-E all things Texas, I'm just not wild about cowboy clothes, unless they belong to, you know, real cowboys. Otherwise they're just posers. I do make an exception to my rule for children dressed in western wear because, well, they're just adorable. 2. 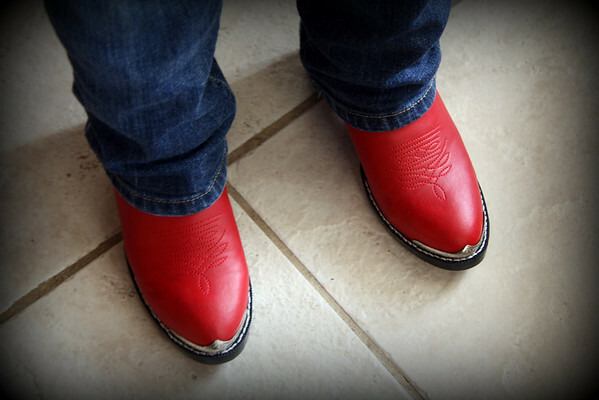 Is there anything cuter than red cowboy boots? With gen-U-iiine silver tips? I don't think so. Even if the genuine silver part is a stretch. Last night (because, really, why plan ahead?) Scott and Annelise went to Academy, Target, Walmart and Payless in a desperate search for boots before finding these at the western wear store three minutes from our house. Don't you like these better than what they came home with last year? 3. However, the western look stopped at the boots. Today they were given a choice of wearing full western wear or Texas sports' team shirts for Go Texan Day, so Annelise decided to wear her favorite player's shirt. 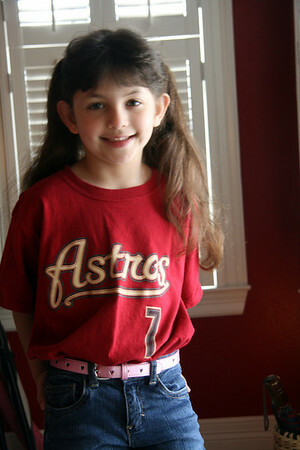 It was a fairly easy decision since she doesn't have any western wear or any other sports' team shirts. She added the pink belt for extra flair, since pink goes with everything. So, here she is pondering the universe in her ensemble 1.5 minutes before we boot-scooted out the door this morning. Well, I flip-flopped. Go Texas! Yee-Haw!, etc. 4. In other news, I have been half-heartedly working on my next two blog books. I can't believe it's been two years since I first published my blog into a book, but am thrilled to have it merrily sitting on our bookshelf. This time, instead of doing one gigantic volume, I plan to make one for 2008 and another for 2009. There may be other programs or methods available for publishing your blog, but I'm using Blurb again. 5. We had our last car payment in January. Cue happy dance. Yesterday, as I was on my way to pick up Annelise from school, three, count them three, dashboard warning lights came on. Happy dance came to a screeching halt. Frantic user guide perusal informed me to take vehicle to dealer ASAP. Dealer is booked up until Tuesday, but assured Scott that everything should be hunky dory until then, we can still drive it. Yeah, right. Two guesses (and the first one doesn't count) as to who traded cars this morning with Scott. Oh...and by the way, it's a Toyota. Just bought Grace some new cowgirl boots at the Justin outlet. They are SO cute. But she really needed them for horseback riding. Lucky for her, Texas day is coming up in the spring. I agree with you that kids look adorable in Western wear. My friend's 18 month old daughter was wearing flashing, pink cowboy boots yesterday and it was the cutest thing to watch her toddling around in them. I have yet to turn my blog into a book, but that is my plan. I have always planned to break them into year-long volumes, but even then I'm totally daunted by the enormity of the work involved in getting it ready. I suppose my current method of not working on it while continuing to post daily is not one of my better plans! 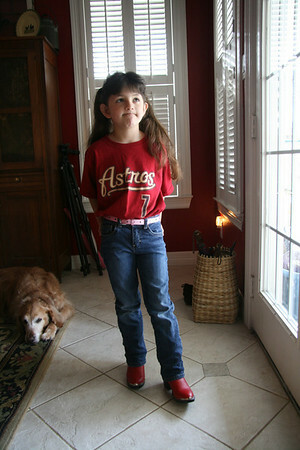 She looks ADORABLE in her Astros shirt, denim, pink belt, pony tails, and red boots. Oh my word, adorable. Too cute - I'm a sucker for a pair of cowboy boots. Wearing some myself today as a matter of fact. I guess at least - on the bright side - you don't have to make a car payment AND a car repair payment. I'll never forget getting my first REAL paycheck after I graduated from college and that very same day I had to have something done to my car. And of course I called my mom to cry about it. How unfair it was, etc etc. And she said "That's really what you work for sista. To earn enough money to keep your car running, your house warm, and your belly full." And so it is.